Training Tooth Paste or Not? One of the questions that parents have been asking around the office lately is when to move their children off of “training toothpaste” and into regular toothpaste. Answer: Immediately! Train not thy children with that useless goop! Training toothpaste contains nothing beneficial to your children. It does not reduce plaque, it does not fight cavities, it does not remove stain. 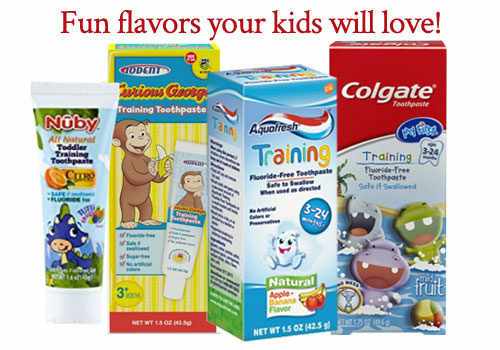 It’s over the top flavor teaches kids that brushing is an experience for tasting, when that is not the primary objective of teaching good oral health habits. Good news Moms and Dads, it’s ok. When using the recommended amount of regular toothpaste (the size of a pea or smaller), the risks of fluorosis are relatively small. Most fluorosis occurs as a result of too much fluoride in their diet during formative years, including supplements (remember the Polyviflor vitamins we took as children). The biggest culprit in fluorosis is improperly fluoridated water, whether by improperly chemical treatment or natural occurrence in the soil. Well water typically contains the most fluoride. In recent years, fluoride has been added to bottled beverages such as sodas and sports drinks. So, the benefits outweigh the risk. The minimal amount swallowed during brushing is not enough to cause permanent damage, and it WILL help you keep your children cavity free. Happy Brushing Mom and Dad. Next Next post: You Find This Tooth Fairy!